Richard Tisei (above) “has always had an unimpeachable record of openness and transparency,” said his campaign manager, Ryan Gough. 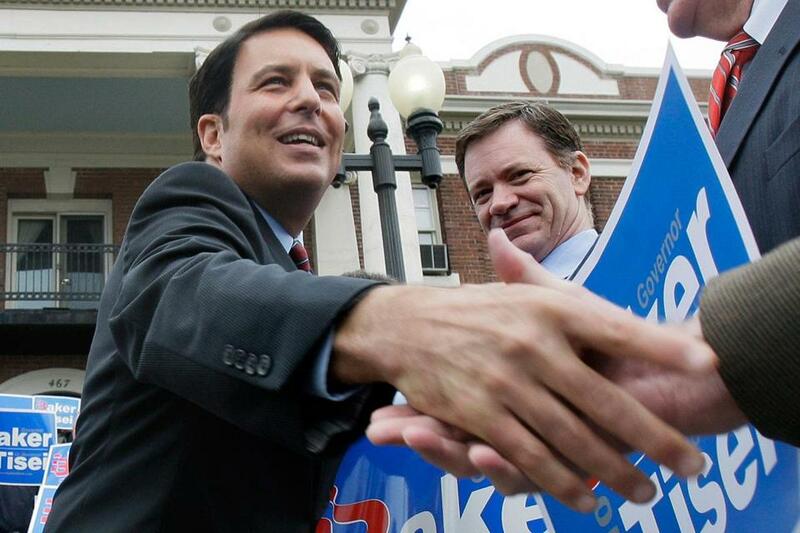 Richard Tisei had lost his 2010 bid for lieutenant governor. But the openly gay Republican who supports abortion rights was still a star in his struggling party. And after the election he approached an old friend, reclusive GOP strategist Arthur J. Finkelstein, to help map the way forward. Finkelstein, who owns a sprawling property on the Ipswich River, is a storied figure in conservative circles. He has advised Israeli Prime Minister Benjamin Netanyahu, worked for President Nixon, and polled for President Reagan. Now, he would do a poll for Tisei — a June 2011 survey testing Tisei’s standing in the Sixth Congressional District, home to Representative John Tierney, a Salem Democrat bogged down in a family gambling scandal. The poll was not unusual. The payment for it, and for Finkelstein’s advice, was. When Tisei cut four checks to the political consultant between June and October 2011 for a total of $20,540, he did not pay out of a federal campaign account. Instead, he tapped a state account he’d built over 26 years as a Beacon Hill lawmaker and candidate for lieutenant governor. The payments appear to violate federal law, which bars the use of state campaign funds in US House and Senate races. And in the months that followed, Tisei made several more questionable expenditures: doling out thousands of state-account dollars to a pair of campaign aides, a Washington-based fund-raiser, and a digital marketing firm, all of them tied to his congressional run. But the Wakefield Republican, who narrowly lost his first challenge to Tierney and is now mounting a second, is hardly the only candidate for federal office who has made eyebrow-raising outlays in recent years. Spending records show several other Massachusetts officials have spent thousands of dollars out of their state accounts on staff and consultants in the run-up to their formal declarations, creating what looks like a series of shadow campaigns outside the reach of federal regulators. The lawmakers flatly deny the existence of those campaigns. The Tisei campaign insists the state payments in question were legitimate, noting that they all came before he officially declared his candidacy for Congress or after his 2012 defeat. The campaign maintains they were designed to assist him in potential runs for state-level office. Tisei declined to be interviewed for this article. Paul S. Ryan, senior counsel at the Campaign Legal Center, a nonpartisan advocacy group in Washington focused on campaign finance reform and government ethics, said it is difficult to refute those explanations in a formal proceeding. But whatever the difficulties of mounting a legal case, he said, the public and the news media should hold officials to account. The rationale for the law is pretty straightforward: Many states allow campaign contributions that are flatly illegal in federal races. In Massachusetts, for instance, unions can give directly to state-level candidates. And they can donate as much as $15,000 to a single politician, well in excess of federal contribution limits. Tapping a state account, then, can amount to a circumvention of federal campaign finance law that predates the Watergate era. But campaign finance observers say the primary motivation is more practical: to use stockpiled, state-level funds to launch a campaign, while preserving precious federal campaign dollars for door-knocking, television advertisements, and other essentials. Consider the most recent federal race in Massachusetts. When US Representative Edward Markey declared in December 2012 that he would run in the special election to replace Senator John Kerry, there was broad interest in his soon-to-be-vacated House seat. And Middlesex Sheriff Peter J. Koutoujian was among those who jumped into the contest. For years, the Waltham Democrat had made monthly payments out of his state account to campaign aide Tsoleen Sarian. And those expenditures continued in the run-up to his formal declaration for Congress on May 30, 2013 — $1,660 in March, $2,280 in April, $2,140 in May. But at least part of Sarian’s time, it appears, was devoted to Koutoujian’s congressional ambitions. On March 2, almost three months before the candidate filed the paperwork for his congressional run, records show she registered koutoujianforcongress.com. The sheriff’s state campaign account dished out $224.10 to GoDaddy.com for “domain registration” on the same day. And two days later, it spent $58 on a “campaign plan lunch” at Scollay Square, a Beacon Hill haunt that serves up miso glazed salmon and beef short rib. Kevin Maccioli, a spokesman for Koutoujian, denied that any of the spending out of the sheriff’s state account was in service of the congressional bid. The “campaign plan lunch” at Scollay Square, he said, was focused on Koutoujian’s 2016 bid for reelection as sheriff — at that time still three years away. Sarian, he said, did not do any work on a Koutoujian congressional bid in this period, other than to register the website. The campaign declined to provide any contracts or invoices for the aide’s work. Koutoujian was not the only candidate in the race spending from a state account. State Senator Karen Spilka, an Ashland Democrat, doled out $9,000 for a spring poll by Princeton Research Associates designed to test her viability in the congressional race and guide a decision on whether to run. Later, she said, the Federal Election Commission advised her federal committee to reimburse the state committee for the work. Spilka said she could not recall whether the FEC contacted her or whether her campaign reached out to the commission, but there is no record in her file of official action by the agency. Spending records show she made the reimbursement in July, and Spilka held up the payment as evidence of her integrity. She also made a $10,000 payment out of her state account to Cambridge political consultant Tom Cosgrove on June 4, 2½ weeks after she declared for Congress. Spilka said the outlay was for work going back several months: “overall messaging” on technology and other issues related to her state Senate work. And there is no evidence that the expenditure, whatever its timing, was improper. Tisei’s spending, though, raises more questions. When the Globe first inquired about the payment to Finkelstein, the campaign said the consultant never conducted a poll for Tisei. But as the inquiry progressed, the campaign hired a prominent Washington lawyer who drafted a letter to the FEC, seeking an opinion on the legality of some of Tisei’s state campaign expenditures. The campaign declined to comment on whether the survey targeted voters in the Sixth Congressional District. But a former Tisei campaign official, who asked to remain anonymous for fear of angering the candidate, acknowledged that the poll did test Tisei’s standing in the district. And Finkelstein, the official added, advised the congressional campaign through the fall. In late October, just weeks before his formal announcement, Tisei also cut $2,500 checks from his state account to two campaign aides, Scott Conway and Ashley Korb. E-mails obtained by the Globe show they were among a small group of operatives organizing his congressional campaign during that period. The Tisei campaign says the payments to the aides were for work performed in previous months, when the candidate was still weighing a run for state office. But the campaign declined to provide contracts or invoices for that work. Once Tisei formally declared for the congressional seat, the state account payments for staff and consultants stopped. But the closely fought race, focused on questions about Tierney’s ethics, was an expensive one. Tisei’s federal committee doled out some $2.3 million during the race, including payments to Eleanor Rollings, a Washington fund-raising consultant who has worked for Republicans all over the country, and Swiftcurrent, a digital marketing firm in Beverly. When the campaign ended, Tisei made two payments from his state account to those firms — a $2,063.53 disbursement to Swiftcurrent in January 2013 and a $2,000 outlay to Rollings the next month. An October 2013 e-mail obtained by the Globe suggests the $2,000 payment to Rollings was for work she did during the congressional campaign. But even if Rollings did engage in new work in that period, the “Federal and National” notation on the invoice raises questions about whether an outlay from the state account was appropriate. If the Republican’s campaign spending does raise red flags, it’s not clear that the Federal Election Commission would be inclined to take remedial action. In 2009, the Massachusetts Republican Party filed a complaint with the commission against Attorney General Martha Coakley, then in the midst of a bid to replace the late Edward Kennedy in the Senate. The complaint focused, in part, on Coakley’s use of state funds to hire two campaign aides — spokeswoman Alex Zaroulis and campaign manager Kevin Conroy — days before Kennedy’s death. She later transitioned the two operatives and several consultants from her state to her federal political payroll. Coakley’s campaign contended, at the time, that she originally hired the staff and consultants for the 2010 attorney general race, though the race was more than a year away and she faced no declared challengers. FEC commissioners ultimately voted, 5 to 0, to dismiss the complaint . But they made no judgment on the merits of the claim about staff and consultant hirings. Instead, they used “prosecutorial discretion” to dismiss the charge, citing the FEC’s limited resources and the relatively small amount of money involved, about $25,000. If these kinds of complaints get little traction with the FEC, the law that undergirds them is a bit slippery, too. Two of the Democrats who ran to replace Markey in the House last year, then-state Representative Carl Sciortino of Medford and then-state Senator Katherine Clark of Melrose, who won the race, made direct $1,000 contributions from their state committees to their federal committees. The outlays appear to violate a federal regulation prohibiting “transfers of funds or assets” from a candidate’s state account to the candidate’s federal account. But the term “transfer” can mean something different than contribution in some sections of federal law. And Clark and Sciortino campaign officials both asserted, in written statements, that the moves were legal. Ryan, the campaign finance lawyer, was skeptical. There appear to be no FEC rulings or advisory opinions indicating that the maneuver is lawful, he said. And absent formal action on the matter, it may remain mired — like much in the world of campaign finance — in ambiguity. David Scharfenberg’s e-mail is david.scharfenberg@globe.com. Michael Levenson of the Globe staff contributed to this report.